This spectacular and highly varied photography tour of Vietnam and Cambodia is aimed at anyone from beginners or keen amateur photographers to budding professionals and is accompanied by one of our experienced professional travel photographers, Gary Latham, or Jeff Perigois, In keeping with the All Points East philosophy, the tour intends to emphasize responsible travel photography that appreciates local people, their cultures and traditions and encourages a positive impact on the places and people it visits. 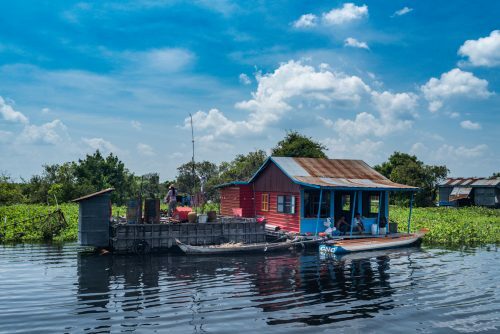 This exciting river and land adventure takes you through the heart of Indochina from Vietnam’s bustling capital Saigon (Ho Chi Minh), and the myriad waterways of the picturesque Mekong Delta, up-river to the hectic but fascinating Cambodian capital Phnom Penh. 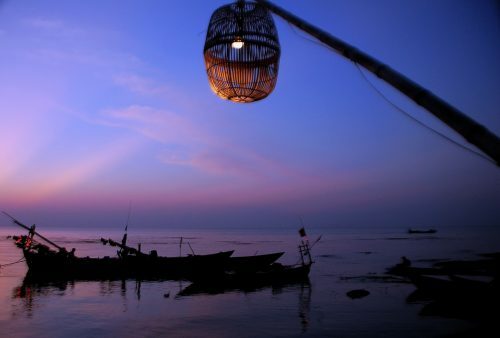 From there we continue across country to Siem Reap to explore the mysterious and evocative, ancient temples of Angkor before returning to Phnom Penh by way of Battambang and a spectacular boat journey through the unique eco-system and floating villages of the Tonle Sap lake. 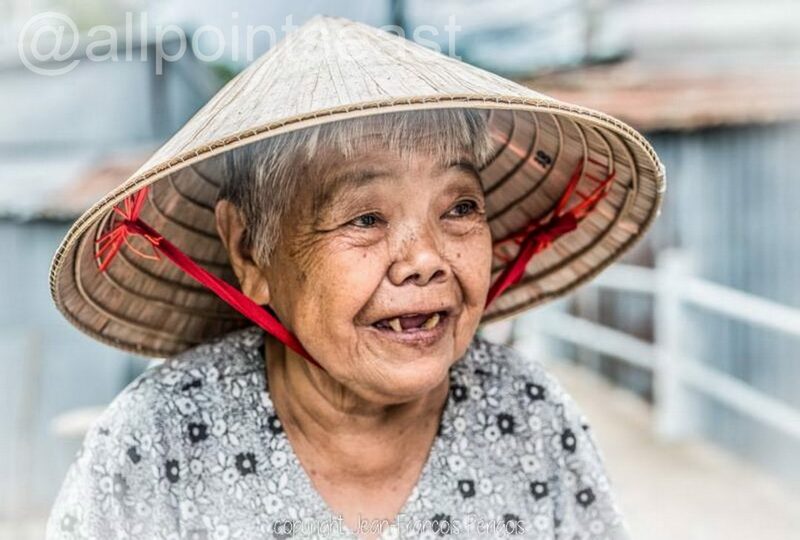 Note that for those with less time on their hands we offer a 2-week Vietnam and Cambodia photography tour beginning in Saigon, (Ho Chi Minh) but finishing with a departure from Siem Reap International Airport. 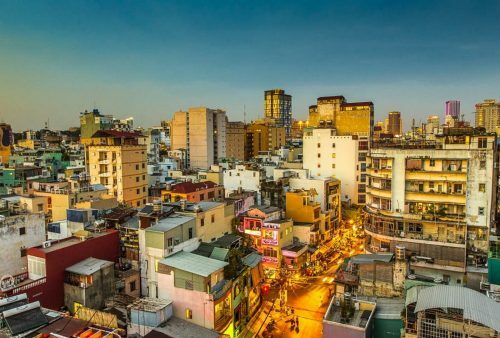 Morning arrival in Saigon (HCM City), check-in to a downtown hotel and meet your photographer for an Introductory discussion – outlining some of the techniques, aesthetics and ethics of travel photography. 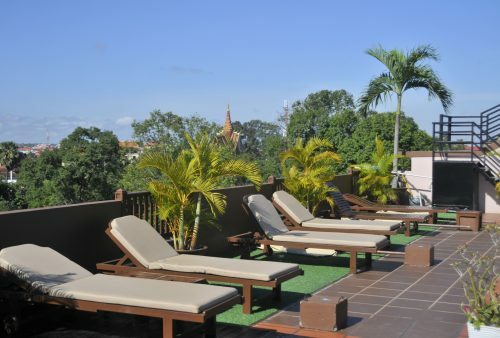 In the afternoon either a leisurely stroll to explore the area or recover from your flight and take in some street scenes from a strategically placed cafe terrace. 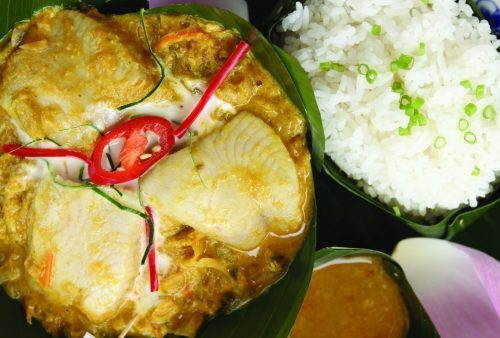 A welcome dinner will introduce you to Vietnam’s celebrated cuisine. 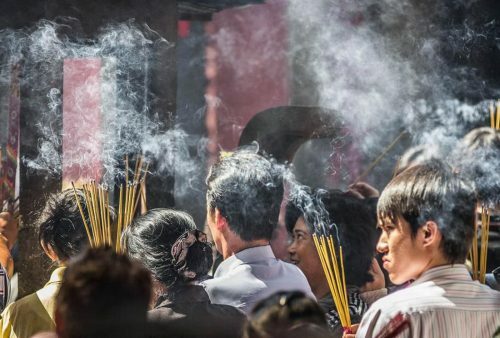 Day tour of the bustling but fascinating city combining some of the famous landmarks such as the Jade Emperor Pagoda, War Remnants Museum and Saigon’s own Notre Dame Cathedral with some of its less often seen back streets, local markets and street-life. 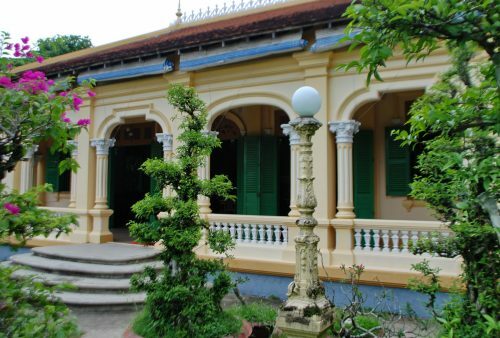 Departure from Saigon, travelling south to the Mekong Delta, our first stop will be the bustling town of My Tho – principal commercial centre and unofficial capital of the Delta region. 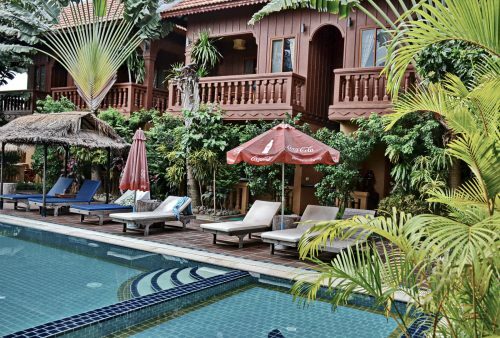 Check-out the colourful market and waterfront comings and goings before continuing to the scenic riverside town of Cai Be for an overnight stay in a converted, French-era villa. Morning visit to Cai Be’s traditional floating market from where we’ll continue by boat through the Delta’s myriad waterways stopping to visit some of the region’s cottage industries and farms as well as a fascinating canoe tour of the former Vietcong jungle base at Xe Quit. 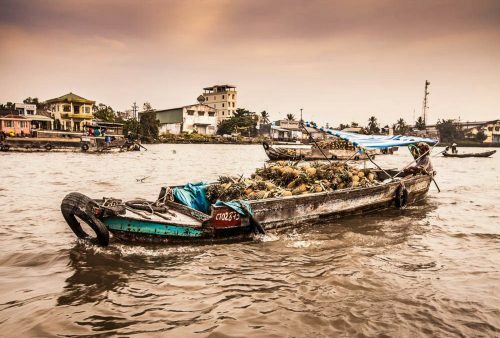 In the afternoon drive to Can Tho with its lively waterfront and an afternoon at leisure to try out some techniques in this picturesque, friendly, riverside town. Early morning boat ride to catch the light at the nearby morning market, one of the busiest and most photogenic of all the Delta’s floating markets. 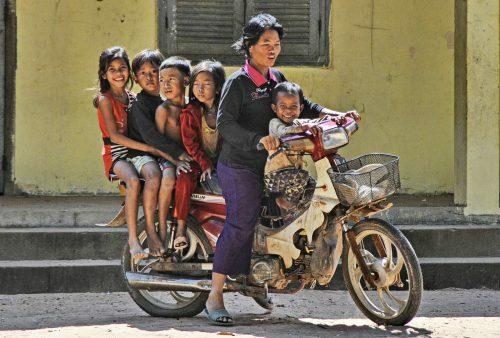 From here we’ll head west to the small riverside town of Chau Doc near the Cambodian border where we’ll explore the myriad shrines and temples of sacred Sam Mountain as well as checking out its spectacular sunset vistas. Departure by boat up the Mekong to Cambodia’s capital Phnom Penh. Lunchtime arrival and check-in to a small, comfortable, downtown hotel before an introductory walking tour providing you with a first-hand feel for the vibrant street-life. We’ll take in the old French Quarter and riverfront before finishing perhaps with sundowners at the famous FCC or Foreign Correspondents Club? 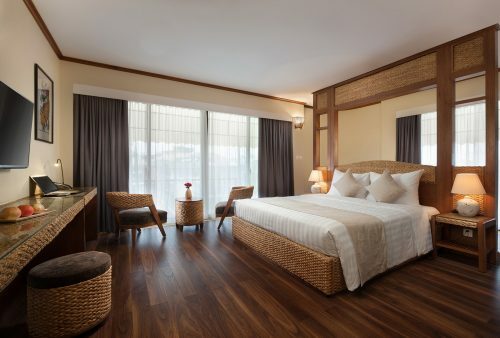 Our day tour of Cambodia’s fascinating capital city will combine some of its famous sites – the infamous Killing Fields, highly moving Khmer Rouge Genocide Museum and the picturesque Royal Palace and Silver Pagoda – with a behind the scenes look at everyday life in the back streets and local markets and opportunities to meet some of the friendly residents. More everyday life and local people images with a morning street photography tour before heading off to nearby Koh Dach (Silk Island). 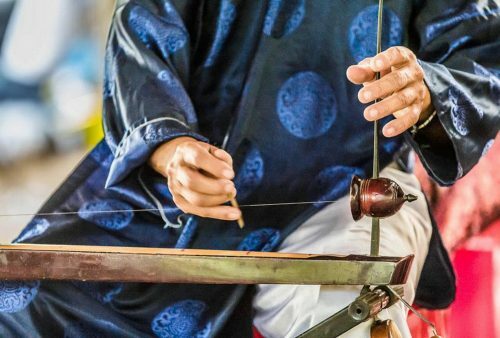 Although situated just a short ride from the city, it’s a world away in feel and allows you to experience local village life as well as the opportunity to discover the traditional silk weaving methods still employed on this photogenic Mekong island. Departure overland through Cambodia’s scenic countryside to the provincial town of Siem Reap – our base for the next few days for our visits to the nearby Angkor temples. 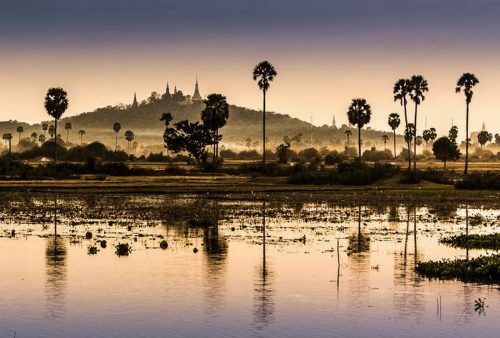 Sights on the way include the famous ‘spider village’ of Skuon (tasting not compulsory), a rarely visited but well-preserved 11th-century temple and landscapes and village life. 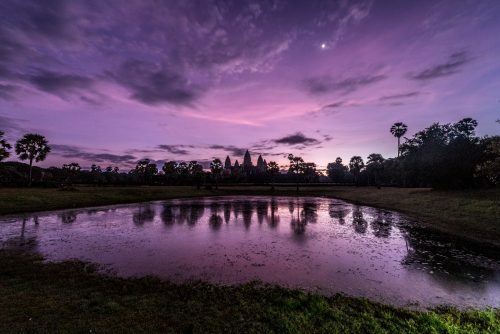 A dusk visit to the atmospheric ruins of Banteay Kdei completes our day. 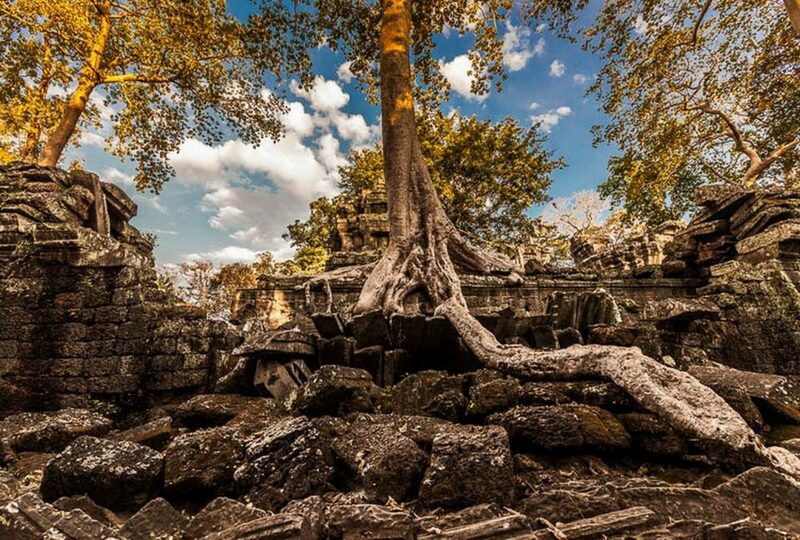 Angkor; a 3-day tour of these fabulous lost cities and jungle-clad temples. 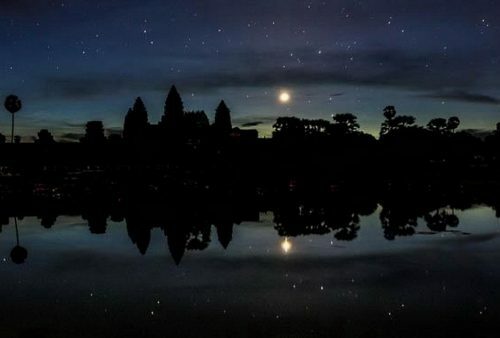 Our programme begins with dawn at Angkor Wat followed by a comprehensive morning tour of the temple itself. 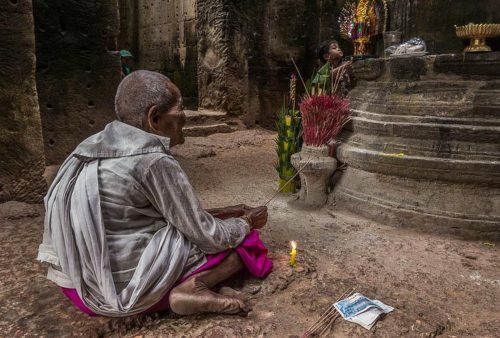 Return to Siem Reap to escape the midday heat before an afternoon walking tour of Angkor Tom, including last but not least, (we’ll wait until the crowds have gone), the dramatic Bayon Temple with its famous faces. Early morning visit to the spectacular Phnom Bakheng temple with its splendid hill-top vistas, before moving on to the vast jungle-clad ruin of Preah Khan. 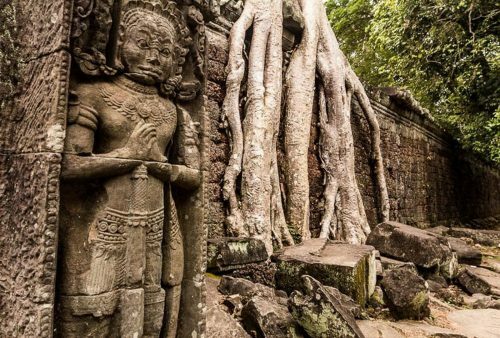 Creepers, vines and enormous roots covering mysterious carvings make this atmospheric temple one of everyone’s favourites. Our afternoon visit proceeds with a short jungle walk to Ta Keo via the remote rarely visited Ta Nei Temple. The famous Ta Prom, ‘Tomb Raider temple’ continues our jungle theme and concludes our day. Morning visit to Beng Melea one of the more remote but most photogenic and atmospheric temple sites. 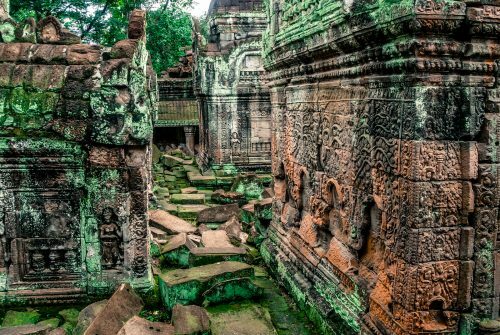 This huge, ruined temple, partially overgrown by jungle, is one of the most impressive Angkor monuments while its more distant location allows for plenty of village and rural landscape views en-route. The afternoon is at leisure to relax by the pool, try a spa or hone your photo techniques in the local markets? Spectacular boat journey to the town of Battambang. 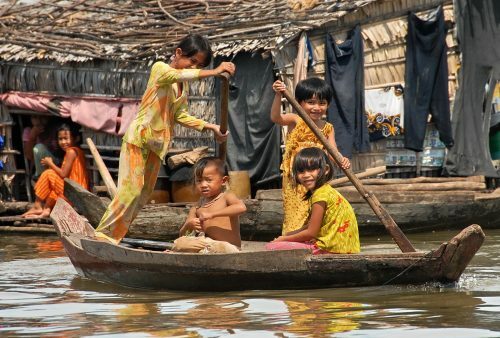 We’ll travel across the Tonle Sap Lake, through the flooded forest and past Prek Toal bird sanctuary and up the Sangkar River with its unique floating fishing villages and stilt houses. Stops on the way include the Prek Toal community water hyacinth weaving project. 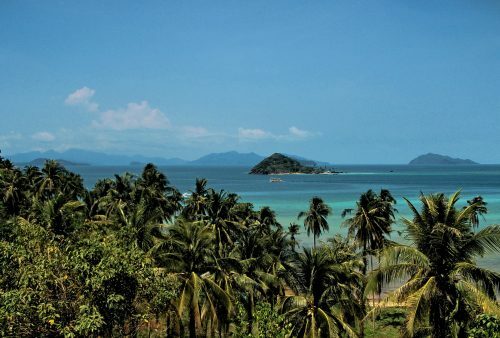 If water levels are too low during the dry season, a section of the boat trip may be by road. Fascinating morning tuk-tuk tour to some of the surrounding villages to meet the local people and discover some of the area’s still very traditional cottage industries, local markets and handicrafts, The afternoon is at leisure to explore the friendly provincial town with its French-period architecture, or just take in the street life from a coffee shop terrace. 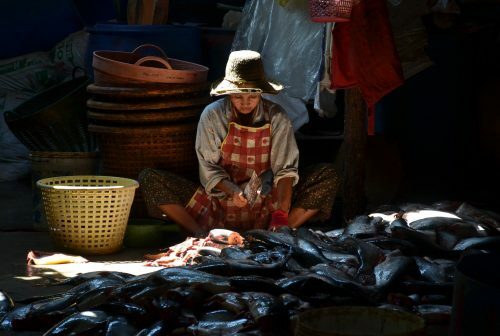 Travelling east, our first stop will be the lively and colourful market in Pursat Town. Plenty of photo opportunities while you check out the weird and wonderful products on display, and meet the very friendly locals. 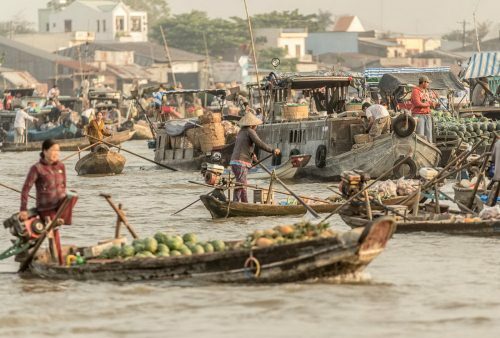 Moving on, we’ll stop at the fascinating river port town of Kompong Chhnang and explore the bustling riverfront area before continuing to our day’s final destination, Phnom Penh. Morning de-briefing session with your photographer and an opportunity to look at some editing and post-production techniques. Afternoon end of tour and departure at your convenience. 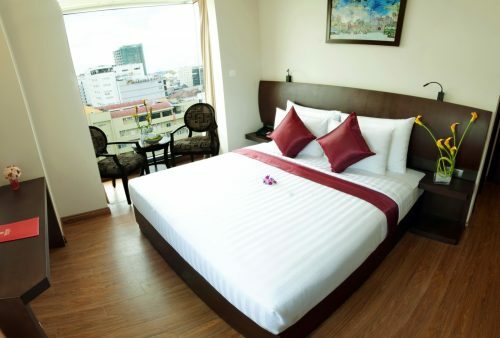 Extra nights in Saigon (Ho Chi Minh) before your tour or Phnom Penh afterwards are available on request.
" This was an outstanding tour – mainly due to the input from our photographic guide, Jeff Perigois. Throughout the two and a half weeks Jeff was continually providing suggestions, advice, guidance and encouragement at a level I have never previously experienced on any photographic tour. He was always anxious to maximise the photographic opportunities for us and felt no obligation to stick rigorously to the published itinerary and timescale if he felt that he could give us better opportunities by varying them (but always only by agreement with the group). 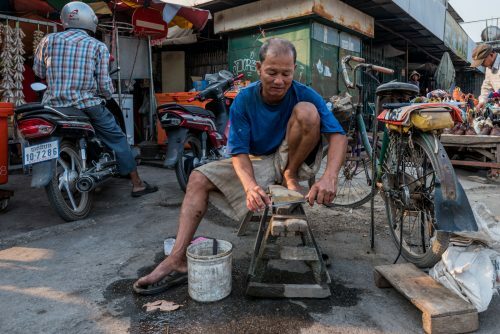 I doubt that “normal” tourists would spend as much time touring local markets as we did, but Jeff’s expertise and advice in street photography were more than I could have hoped for.) "
" Amazing. This is definitely a destination to visit. The tour leader and local guides know when to get the best lighting, and where to go to get amazing shots. Our photographer, Gary Latham, was very helpful whenever we needed it as well as informative and I really benefited from all the tips and instructions I received from him. Thank you. " 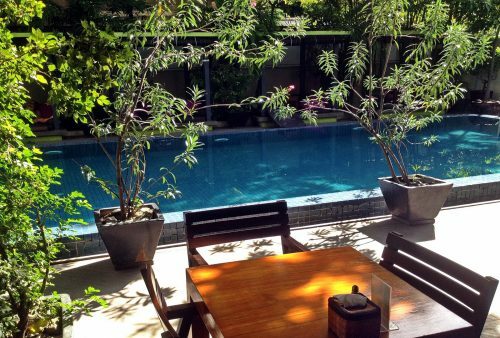 " I thoroughly enjoyed my trip and highly recommend it as I had a brilliant experience. This was helped along by our excellent photographer guide, Jeff, and the local guides. What an adventure! All parts were memorable and the pagodas and temples were amazing. One thing which was great was that street photography is so easy - people really don't mind you taking their pictures if you interact, are polite and not obtrusive.
" I've done a number of photography tours with Jeff now and am always pleased with his advice and ability to get us to the right places at the right time. 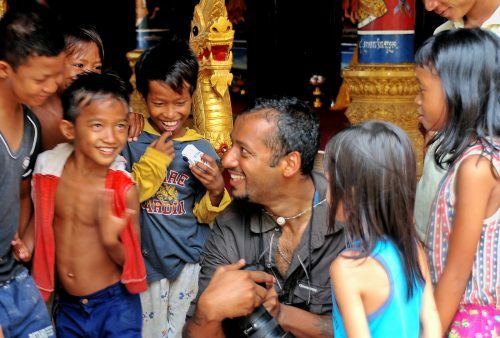 Being a resident of Cambodia, he really knows his stuff. "